On this day in 1995, the Nigerian government - under the direction of Shell Oil - assassinated Nigerian environmental leader Ken Saro-Wiwa after a show trial and a rushed execution. He successfully - and peacefully - organized his people to demand their rights in the face of an ecological holocaust perpetrated by Shell Oil. From the members of a relatively small ethnic group in Nigeria, he organized 300,000 to march (more than half the adult population), forcing Shell Oil and the Nigerian army out of a region they were looting and despoiling. There was a global outcry about Saro-Wiwa's treatment and eventual murder including a call by the Clinton administration to the United Nations to condemn the executions and embargo sales of weapons to the country's military. 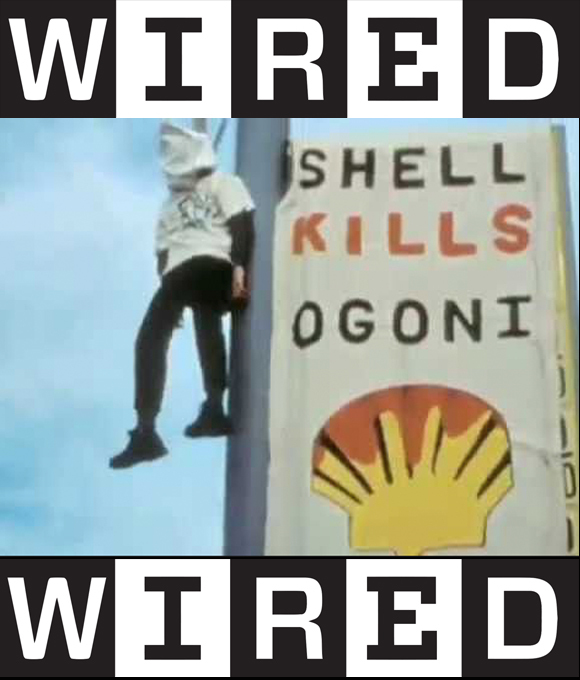 Two of the key editorial contributors to Wired in those days, Stewart Brand and Peter Schwartz, were at the time in the employ of Shell Oil through a company they founded called Global Business Network. An examination of the exact nature of one of Mr. Schwartz's projects with Shell at the time will prove illuminating. Because Saro-Wiwa was so successful in his work, he been largely written out of history. However his legacy is massive. "Saro-Wiwa�s most important legacy was the push to hold corporations accountable when their operations violate local or international laws and the companies hide behind a complicit or ineffectual government." "In 2013, a Dutch court found Shell guilty in destroying the livelihood of farmers through oil spills and inadequate responses. The ruling was upheld on appeal in 2015. Earlier this year, Nigerian groups were allowed to proceed with a similar case against Shell in the United Kingdom."